Analysis: Martino who? Is 'El Tata' the man for Barcelona? Martino who? That’s what most football fans were thinking when Gerardo “El Tata” Martino was announced as FC Barcelona’s new manager. The truth is the 50 year-old Argentine is practically unknown outside of South America, given he has only ever managed in his home continent. So how did he get the job? Well, in my opinion, there were three factors which led the reigning Spanish Champions to appoint Martino: the influence of Leo Messi, the coach’s football philosophy, and the lack of other alternatives. So let’s start with Messi and his influence at Barcelona. From various sources close to the club, I have heard repeatedly that the Argentine star calls a lot of shots behind the scenes. For example, his desire for the team to play around him was one of the reasons the club sold Zlatan Ibrahimovic, Samuel Eto’o and David Villa. All of them were world class strikers who had to tip-toe their way around Messi before being shipped out of the Camp Nou after being considered surplus to requirements. As far as the role Leo had in the new manager’s appointment, it is easy to find links between Messi and Martino. First of all, they are both from Rosario, in Argentina. Second of all, Leo’s dad, Jorge, idolized Martino in the 90’s when he played for his local club, Newell’s Old Boys. And thirdly, one of Martino’s assistants once coached little Leo when he was a 10-year-old back home. So onto Martino’s football philosophy. Those who know him well say he believes that the best defence is a good attack. During his early coaching days, his mentor was Marcelo Bielsa and there is little doubt he sings from the same hymn book as "El Loco," meaning he is a fan of attacking, free-flowing football. That will be music to the ears of Barcelona fans since this team is built to play that way. I expect Martino to keep the 4-3-3 formation which is familiar to the players and continue to encourage the team to play a high pressing game. Considering the team will keep a similar playing style to the one deployed by former Barca coaches Pep Guardiola and Tito Vilanova, I believe Martino’s big challenge this season will be keeping Messi and new signing Neymar happy. The Brazilian may have arrived at Barcelona knowing it’s all about Leo, but he will still expect to play an important role in the team, and finding a balance between both superstars may be trickier than the new coach is expecting. I am curious to find out how he will manage their egos, especially considering the fact he has never dealt with such high-profile players in his career. So was "El Tata" the right choice? Barcelona will argue they didn’t have many people to pick from. To be fair, the club’s directors had to make a move quickly after Vilanova announced he would have to leave his post to continue his battle against cancer. With the season just a couple of weeks away, most if not all of the top managers were taken, so they really didn’t have much choice. Former player Luis Enrique was linked to the post, as was Dutch veteran Guus Hiddink, but neither confirmed they had been officially approached. In the past, Barcelona had elected to appoint someone from within, but at this moment there was no-one with the capacity or charisma to take over. We all saw what happened when Jordi Roura had to fill in for Vilanova last season. There was lack of leadership, lack of direction and lack of inspiration from the sidelines. The jury is out on Martino. On his side, he has one of the most skilful teams ever assembled. Against him, he has the pressure of making them win, and win in style. there are other coaches that have far more experience in Europe than this dude. As for Leo I would like to see himprove himself outside of Barca. He is a gifted player for sure but I would like to see how he does without Xavi, Iniesta, others around him. I always thought Martino was perfect for Barcelona. He knows the value of playing hard pressing football, the need to always count with surprise alternatives and his love of flair. I came across this article and began reading the commentsd – all them negative or skeptical. So far Martino has shown as that he has nothing to envy Guardiola. He doesn't make weird experiments, like Vilanova; he reads matches well, and always find quick fixes to them – as opposed to Guardiola, who is stubborn and sometimes too arrogant. Stats-wise, Martino has already bested Vilanova – who happened to be a disgrace as a manager. I think Martino can get away with La Liga and go to the final of the UCL (hope he avenges our humiliating defeats by Bayern Munchen) so long as Barça has no significant injuries in the first line-up. Visca el Barça! Big up martino for join Barcelona. He is a great coach with a winning history in South America. 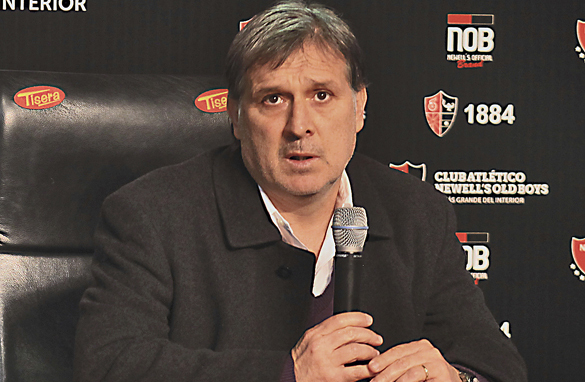 The current champion of the Argentine League with Newell's Old Boys and he coached Paraguay from 2006 to 2009 and made it a strong team. His style is similar to the current Barcelona's style but he likes to have a strong defence to go with a great offence. He will be a success at Barcelona. Great coach with a winning history. Great Piece Pedro, but i defer in saying Messi influenced the decision of Tata's appointment. I Also beg to defer about it was all because of Leo Messi that David Villa,Eto' o and Zlatan were sold. Samuel Eto'o played and won the UEFA Champions League but maybe there was a fall out with Pep and not about Leo. intresting to see how Messi and Neymar works together next season. This article displays how Euro-centered CNN World Sport really is. Pedro Pinto writes: "The truth is the 50 year-old Argentine is practically unknown outside of South America, given he has only ever managed in his home continent." So what? If Martino never went to Barcelona, he would not deserve a place in the media? What if Leonel Messi had never gone to play in Europe, would he be a lesser player than he is now? Would he be less known to the world? And how many European coaches have ever managed outside Europe before gaining notoriety through CNN and the likes? This article makes it very clear to me how bias the "World Sports" writers at CNN really are. Pedro Pinto keeps feeding us articles about Real Madrid and Barcelona only, clubs that have not won much outside Spain recently, and he only writes about South American clubs and stars when they come to Spain. I see a very wrong picture in all this. Pedro, Spain is no longer the center of the world and it hasn't been since the 16th Century. Time to change your journalist practice and start covering South american football BEFORE it comes to Spain, I mean. Yes- the Neymar Messi dynamic will be fascinating to watch. I agree with Glauco Ortolano. Regarding Tata's appointment, we read much bias of the Western press. Seemingly the press keep a wrong assumption that their ignorance is equal to others' incapability. Tata, it is time to prove the Western press wrong. How could they keep underestimating the Latin Americans and the Africans while their European teams are being flooded by players (and coaches) from those two continents? Wishing Martino, his footballers and fans happy times at Barça.